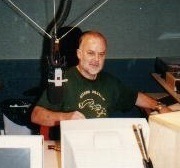 John Peel, was an English disc jockey, radio presenter, record producer and journalist. He was the longest-serving of the original BBC Radio 1 DJs, broadcasting regularly from 1967 until his death in 2004. He was known for his eclectic taste in music and his honest and warm broadcasting style. He was one of the first broadcasters to play psychodelic rock and progressive rock records on British radio, and he is widely acknowledged for promoting artists working in various genres. Peel’s Radio 1 shows were notable for the regular ‘Peel sessions‘, which usually consisted of four songs recorded by an artist live in the BBC’s studios, and which often provided the first major national coverage to bands that later would achieve great fame. In 2002, John Osborne won a competition on John Peel’s Radio One show. His prize was a box of records that took eight years to listen to. This performance is an ode to radio, those records and anyone who’s ever sought solace in wireless. John Peel’s Jacksons LaneShed :: Jacksons Lane. This entry was posted in Book Tickets Now! and tagged Disc jockey, John Osborne, John Peel, John Peel's Shed. Bookmark the permalink.